Woodson was drafted by the Oakland Raiders fourth overall in the 1998 NFL Draft. In his first season with Oakland, Woodson was selected as the NFL Defensive Rookie of the Year by the Associated Press. He was named to the Pro Bowl and earned All-Pro recognition three consecutive times (1999–2001). In a 2002 AFC playoff match against the New England Patriots, Woodson seemed to have clinched the game by forcing a fumble by sacking quarterback (and former Michigan teammate) Tom Brady, but the ruling was overturned. Woodson later battled several nagging injuries in consecutive seasons in Oakland, leading to his departure after the 2005 NFL season via free agency. On April 26, 2006, Woodson signed a seven-year, $52 million contract with the Green Bay Packers. He would later win Super Bowl XLV with the team over the Pittsburgh Steelers. In his first season in Green Bay, Woodson was the team's punt returner and led the National Football Conference with eight interceptions, surpassing his previous career high of five, in his rookie year. In his second season in Green Bay, the injury problems returned and Woodson was forced to sit out two games. He was the AP NFL Defensive Player of the Year for the 2009 NFL season. He returned to the Raiders in 2013, playing three more seasons and once more being voted to the Pro Bowl. Woodson is one of the few players in NFL history to play in a Pro Bowl in three different decades (1990s, 2000s, 2010s). He is currently tied for fifth on the all time interceptions list with 65, and is tied with Rod Woodson and Darren Sharper for most career defensive touchdowns with 13. He also is second all time in interceptions returned for touchdowns, with 11. After he retired in 2015, he signed with ESPN in 2016. Woodson was born in Fremont, Ohio. As a senior at Ross High School, Woodson was named Ohio's "Mr. Football." He finished his high school football career with the school's records for rushing yards (3,861) and scoring (466 points). In his senior season, he was a USA Today All-America selection and Parade High School All-American and recorded 2,028 yards and 230 points. All colleges recruited Woodson as a running back, while Michigan recruited him as a defensive back. In addition to playing football, Woodson also played basketball (point guard) and competed in track & field (relay sprinter and long jumper). Woodson attended the University of Michigan, where he played for coach Lloyd Carr's Michigan Wolverines football team from 1995 to 1997. He became the starter after the second game of his freshman season and played in 34 straight games. In addition to playing cornerback, he returned punts and occasionally played as a wide receiver. In 1995, Woodson was selected as the Big Ten Freshman of the Year. He was named to the All-Big Ten First Team by conference coaches, and second-team All-Big Ten by the media. He led the team with five interceptions and eight takeaways. In 1996, Woodson set a Wolverine record for pass breakups with 15. For his efforts, he was named the Chevrolet Defensive Player of the Year and an AP First Team All-American. He was a finalist for the Jim Thorpe Award and named to All-Big Ten First Team by conference coaches and the media. In his junior season in 1997, Woodson became the third Michigan player to win the Heisman Trophy, joining Tom Harmon (1940) and Desmond Howard (1991). Woodson received 282 more voting points than runner-up Peyton Manning of Tennessee. He was the first and is still the only primarily defensive player to win the prestigious award. Woodson is the last player to win the Heisman Trophy that is not a running back or quarterback. Woodson led the Michigan Wolverines to an undefeated season and a share of the national championship in the same year. He won the Bronko Nagurski Trophy as the best defensive college player. He was named to the All-Big Ten First-Team for the third year and was recognized as a consensus first-team All-American. It was his second year winning the Chevrolet Defensive Player of the Year award and Big Ten Defensive Player of the Year. Woodson won the Jim Thorpe Award, an award which he was nominated for the previous year. Throughout college, Woodson was known for big plays in big moments of a game. As a freshman, he had two interceptions in a victory against the #2-ranked Ohio State Buckeyes. During his Heisman-winning junior year, he made an acrobatic one-handed sideline interception against the Michigan State Spartans. Woodson had two interceptions in the game. In a game against Ohio State, he returned a punt for a touchdown, made an interception in the end-zone, and had a 37-yard reception that led to Michigan's only offensive touchdown of the game. Woodson later stated that he tried to do Howard’s famous “pose” after scoring the touchdown, but failed after his teammates mobbed him in the end zone. The win over the buckeyes lifted Michigan to the Rose Bowl. Michigan played the Washington State Cougars in the Rose Bowl. Woodson recorded another end-zone interception in the game, helping Michigan defeat the Cougars and win a share of the 1997 national championship. Woodson finished his college career with 18 interceptions and 30 passes defended. On December 12, 2014, the Big Ten Network included Woodson on "The Mount Rushmore of Michigan Football", as chosen by online fan voting. Woodson was joined in the honor by Tom Harmon, Desmond Howard and Anthony Carter. Of the honor, Woodson told BTN Live host Mike Hall, "It's really a big deal. To be one of the four people to be picked, that's a really big honor and I'm appreciative of it." Woodson declared his eligibility for the NFL Draft following his junior season at Michigan and was selected with the fourth overall pick of the 1998 Draft by the Oakland Raiders. After Woodson's first season in the NFL he was named the NFL Defensive Rookie of the Year by the Associated Press. He started all sixteen games, becoming the first rookie Raider since 1971 to do so. Woodson had 64 tackles that season. He was also third in the league in interceptions (with five), returned one interception for a touchdown against the Arizona Cardinals, and produced one forced fumble. Woodson was named to his first Pro Bowl. In his second season in 1999, Woodson had his first career reception, a 19-yard catch, against the San Diego Chargers on November 14. 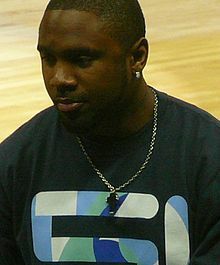 On November 28, against the Kansas City Chiefs, he had a 15-yard interception return for a touchdown in the 37–34 loss. He finished the season with 61 total tackles and a fumble recovery to go along with the pick-six. Woodson was selected to his second Pro Bowl and was named All-Pro by the Associated Press. In the 2000 NFL season, Woodson started all sixteen games of the season but suffered a turf toe injury, which prevented him from practicing. He finished the year with a career-high 79 tackles, intercepted four passes, forced three fumbles, and recovered one fumble. He was named to the All-Pro team by Sports Illustrated, and second-team honors from the Associated Press. In 2001, his fourth year in the NFL, Woodson started sixteen games. This was the fourth consecutive year Woodson played in every game of the season. Woodson finished with two sacks, one interception, one forced fumble, and one blocked field goal. Woodson returned punts for the first time in the NFL, returning four punts for 47 yards. He was named to his fourth consecutive Pro Bowl. He made All-Pro teams of The Sporting News and College and Pro Football Newsweekly and the All-AFC squad of Football News. In 2002, Woodson suffered his first major injury since his freshman year at Michigan, suffering from a shoulder injury which caused him to be inactive for eight games. The shoulder injury came in the first half of the second game of the season. Despite the injury Woodson played the remainder of the game and was able to force a fumble. After recovering from his shoulder injury, Woodson missed the last three games of the regular season, suffering from a cracked fibula bone in his right leg. Woodson started every Raider game in the 2003 NFL Playoffs, finishing with a start in Super Bowl XXXVII. In the Super Bowl, Woodson showed signs of his injury, but still recorded an interception in a losing effort against the Tampa Bay Buccaneers. After losing the Super Bowl in the year prior, the Raiders finished the 2003 NFL season with a dismal record of 4-12. Woodson became unhappy with new head coach Bill Callahan, and criticized him during the season. Woodson remained healthy for the entire season, starting in his first fifteen games. His contract was set to expire after the season. Woodson reached an agreement with Oakland and was labeled as a franchise player. The franchise tag set Woodson's contract with a minimum of the average salary for the top five cornerbacks in the NFL. Although being labeled as a franchise player, Woodson's contract was only for one year. In the 2004 NFL season Woodson played the first 13 games of the season before suffering a leg injury which put him inactive in the last three weeks. He finished the season with 73 total tackles, 2.5 sacks, one interception, nine passes defensed, two forced fumbles, and one fumble recovery. After the season, Woodson again agreed to a one-year franchise tag deal. In the 2005 NFL season, he started the first six games but broke his leg in the sixth week, which sidelined him for the rest of the year. He finished the season with 30 total tackles, one interception, four passes defensed, and one forced fumble. 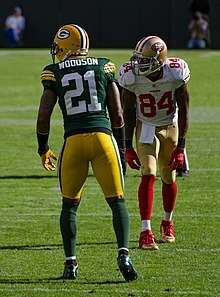 Free of any major injuries during the 2006 season, Woodson (tied with Walt Harris formerly of the San Francisco 49ers) led the National Football Conference with eight interceptions. At the time, that was the most interceptions Woodson had recorded in a single season (until he had 9 in 2009). On October 22, he had a 23-yard interception return for a touchdown against the Miami Dolphins. Overall, he was tied for third in that statistic in the entire NFL. He was used as his team's starting punt returner for the first time in his NFL career, returning 41 punts for 363 yards. On October 14, 2007, Woodson picked up a Santana Moss fumble and returned it 57 yards for a go-ahead touchdown in a 17-14 victory over the Washington Redskins. He recorded an interception in the game, his first of the season. Woodson was named the NFC's Defensive Player of the Week for his performance versus the Redskins, which was the first time he had received that award. On November 4, Woodson had a 46-yard interception return for a touchdown with 59 seconds remaining in the 4th quarter to seal a win over the Kansas City Chiefs. He finished the season with 63 total tackles, four interceptions, nine passes defensed, and two fumble recoveries. On September 15, 2008, Woodson recorded two interceptions in a 48-25 victory over the Detroit Lions. He returned the second interception 41 yards for a touchdown. Woodson was named NFL Defensive Player of the Month for September in both 2008. On December 16, 2008, Woodson was named to his fifth Pro Bowl, his first with the Packers. Overall, he finished the season with 62 total tackles, seven interceptions, two pick-sixes, 17 passes defensed, one forced fumble, and one fumble recovery. On November 15, 2009, Woodson recorded nine tackles (two for loss), a sack, two forced fumbles and an interception in a 17-7 victory over the Dallas Cowboys. Woodson is the first player in NFL history to have a sack, two forced fumbles, and an interception in a game. He was named NFC Defensive Player of the Week for his performance. On November 26, 2009, Woodson had an impressive Thanksgiving game at Ford Field against the Detroit Lions. He recorded 7 tackles, 1 sack, 1 forced fumble and recovery (same play), 4 passes defended and 2 interceptions, one of which he returned for a touchdown. He covered star receiver Calvin Johnson and limited him to 2 catches for 10 yards. Although one of these was a touchdown, Green Bay won the game 34-12. Woodson was named NFC Defensive Player of the Week for this performance and was named NFC Defensive Player of the Month for the month of November. In January 2010, Woodson was named the NFC Defensive Player of the Month for December 2009. He is the only defensive player to ever receive this award 3 times in the same season, and joins Barry Sanders and Mike Vanderjagt as the only NFL players to receive a Player of the Month award 3 times in a single season. For his effort during the 2009 season Woodson was selected as the AP Defensive Player of the Year. Overall, he finished the season with 74 total tackles, nine interceptions, three pick-sixes, 18 passes defensed, four forced fumbles, one fumble recovery, and two sacks. Woodson had more interceptions in his first four years with the Packers (28) than he did in his previous eight with the Raiders (17). He also has more touchdowns (8 vs 2) and sacks (6 vs 5.5) with the Packers than during his time in Oakland. He holds the Packers' franchise record for most defensive touchdowns (8 total, 7 interception returns and 1 fumble return). 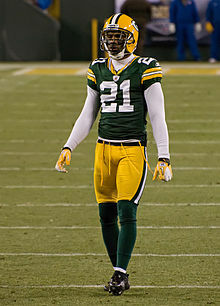 During the 2010 season, Woodson recorded two interceptions and five forced fumbles for the Packers. He was named to the 2011 Pro Bowl as a starting cornerback. It was his seventh career selection to the Pro Bowl. 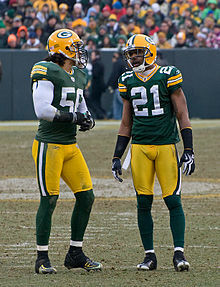 Woodson was named co-captain along with teammate A. J. Hawk for the Packers defensive unit through the post-season. He provided a huge performance, limiting Pro-Bowler DeSean Jackson to just two catches (for 47 yards), and recorded 5 tackles in the Packers win over the Philadelphia Eagles on January 9, 2011. Woodson also played an important role in Dom Capers' defense in playoff victories against the Atlanta Falcons and Chicago Bears and started against the Pittsburgh Steelers in Super Bowl XLV. With 1:54 before halftime of the Super Bowl, Woodson broke his collar bone while diving to successfully defend a pass intended for Mike Wallace. An emotional Woodson gave a speech to his teammates during halftime. Watching from the sidelines in the second half, Woodson cheered his team on to a 31-25 victory, his only championship title. Despite his Super Bowl injury, Woodson finished the game with three total tackles, of which two were solo..
Barack Obama said if the Bears won the NFC Championship, that he would see them play in Super Bowl XLV, but he would not see Green Bay. Woodson sent Obama a jersey saying, "See you at the White House!" and had a pep talk in the locker room. He told the team if the President did not want to see the Packers play in the Super Bowl then they would go to the White House. The Packers won the Super Bowl. However, they could not visit the White House until August because of the terms in the NFL Lockout. When they visited the White House, Obama made reference to Woodson's pep rally and autographed jersey. Woodson responded by handing Barack Obama a certificate stating that Obama is a minority owner of the Packers. Obama also said, "I have learned something that many quarterbacks have learned. Don't mess with Charles Woodson." Engraved inside the 2010 Super Bowl Ring is the numeral “1” along with the words “Mind, Goal, Purpose and Heart”. The number and terms veteran cornerback Charles Woodson used during his memorable postgame locker-room speech following the NFC Championship in Chicago. On September 9, 2010, despite having three years left on his current contract, a thirty-three-year-old Woodson was offered and signed a two-year extension with the Packers, adding five years and $55 million to his existing pact. When Woodson intercepted Cam Newton against the Carolina Panthers in Week 2 of the 2011 season, it marked the fourth time he had intercepted a fellow winner of the Heisman Trophy.The other three quarterbacks he intercepted a pass from were Vinny Testaverde, Carson Palmer, and Matt Leinart. Woodson joined the 50-interception club when he picked off Kyle Orton in the first quarter in Week 4. This, his eleventh career interception return for a touchdown, places him second all-time behind Rod Woodson, who was not related to him. He finished the season with 74 total tackles, seven interceptions, one pick-six, 17 passes defensed, one forced fumble, one fumble recovery, and two sacks. Woodson started 2012 in a different role for the Packers, hoping to fill the void left by free safety Nick Collins, who had been out of football for almost a year with a neck injury. He described it simply as "just playing football". Defensive Coordinator Dom Capers' plan appeared to be to line Woodson up at the safety position, while also situationally deploying him as the nickel-back. This saw Woodson in a Polamalu-like position of the Pittsburgh Steelers, lining up on either side ready to rush or drop back in coverage. Against the 49ers in week 1, the 35-year-old Woodson recorded 5 tackles, 1.5 sacks, and a forced fumble in a losing effort. Against Chicago Bears in week 2, he recorded his 55th interception of his career, and first as a strong safety. The pass was intended for Earl Bennett. Woodson suffered a broken collarbone during the Packers' victory over the St. Louis Rams on Sunday, October 21, and was out for the next nine games. Overall, he finished the season with 38 total tackles, one interceptions, five passes defensed, one forced fumble, and 1.5 sacks. Woodson sat out several weeks with the broken collarbone, but made it back for the first playoff game against the Vikings. He helped the Packers defeat the Vikings, but his team would fall to the 49ers the following week. On February 15, 2013, the Packers released Woodson. On May 21, 2013, Woodson signed a one-year deal with the Oakland Raiders. He played in the preseason and started in week 1 against the Indianapolis Colts. On October 6, in a game against the San Diego Chargers, Woodson tied the NFL record (with Darren Sharper and former teammate Rod Woodson) for most defensive touchdowns by scoring on a fumble recovery for his 13th defensive touchdown. By season's end, he had played in 1,067 of 1,074 possible defensive snaps for the team amassing 97 tackles (75 solo), 2 sacks, 3 forced fumbles, 2 fumble recoveries, 3 pass defenses, 1 interception, and the aforementioned touchdown. In the 2014 season opener, Woodson recorded an interception against the New York Jets. On December 7, 2014, he picked off Colin Kaepernick of the San Francisco 49ers for his 3rd interception of the year, which sealed a Raiders victory. Woodson finished the season with 111 total tackles, four interceptions, eight passes defensed, one fumble recovery, and one sack. On January 26, 2015, the Raiders announced via Twitter that they had agreed to a contract for Woodson to return in 2015. In the 2015 season, Woodson was moved to strong safety. After this switch, Woodson became one of the few players in NFL history to play at all three spots in the secondary. Prior to Week 5 against the Broncos, Woodson said that he always wanted to intercept a pass from Peyton Manning, as he had never accomplished the feat over his career. Woodson lived up to his word and picked off Manning two times. However, the Broncos won 16-10. On December 21, 2015, Woodson announced that he would retire at the end of the season. On January 3, 2016, he played in his final NFL game, a 23–17 loss to the Kansas City Chiefs. He finished his final season with 74 total tackles, five interceptions, nine passes defensed, one forced fumble, and four fumble recoveries. On February 12, 2016 it was announced that Woodson would be joining ESPN's Sunday NFL Countdown, replacing Keyshawn Johnson for next season. Woodson is an oenophile who developed his interest in wine while playing football for the first time in Oakland, near the Napa Valley. He partnered with former Robert Mondavi winemaker Rick Ruiz to develop a signature wine label, "Twentyfour by Charles Woodson". The company is based in Napa, California, and is a small boutique winery, producing fewer than one thousand cases per year of its two varieties, Cabernet Sauvignon and Cabernet Franc. Although the wine bears his name and signature, Woodson was warned by the NFL not to be seen endorsing the wine himself because of the league's alcohol policy. On November 26, 2009, Woodson contributed $2 million to the University of Michigan C.S. Mott Children's Hospital for pediatric research. Woodson has his own charitable foundation to support the fight against breast cancer known as "Charles Woodson Foundation". In October 2012, Woodson donated $100,000 to the Hurricane Sandy relief effort. During the Green Bay Packers' 2010 Super Bowl winning season, Woodson publicly called out US President Barack Obama on the latter's support for longtime Packers' rivals, the Chicago Bears. In a post-game locker room interview, Woodson stated, "The President don't want to come watch us win the Super Bowl? Guess what? We’ll go see him" (implying that Green Bay would win the Super Bowl and visit the White House as the winning team does each year; a statement that would come true). During the 2012 United States Presidential election campaign, Woodson publicly endorsed Obama at a political rally in Green Bay, stating "I believe in what he's trying to do." ^ a b 1997 - 63rd Award Charles Woodson Michigan Cornerback Archived October 2, 2013, at the Wayback Machine from Heisman.com. ^ a b c d e f g h i "Charles Woodson". Green Bay Packers. Archived from the original on January 19, 2013. ^ "2006 NFL Stats". NFL.com. Retrieved November 30, 2007. ^ "Charles Woodson, CB for the Green Bay Packers". NFL.com. Retrieved December 20, 2010. ^ "NFL Interceptions Career Leaders - Pro-Football-Reference.com". Pro-Football-Reference.com. ^ "Raiders DB Charles Woodson ties NFL record for most defensive TDs". CBSSports.com. Retrieved November 21, 2015. ^ "NFL Career Interception Returns for Touchdown Leaders | Pro-Football-Reference.com". Pro-Football-Reference.com. Retrieved November 21, 2015. ^ McGowan, Rich. "Memories 'come flooding back' for Ross' NFL alumni". The News-Messenger. Retrieved February 24, 2018. ^ King, Peter. "'Who is Friggin' Tougher than Charles Woodson?'". SI.com. Retrieved February 24, 2018. ^ "2004 High School Football: Best Players ('94-'03)". The Blade. August 26, 2004. Retrieved February 24, 2018. ^ Danois, Alejandro. "Celebrating 20 Years Of Charles Woodson's Heisman Magnificence". The Shadow League. Retrieved February 24, 2018. ^ "Charles Woodson". Parade. Retrieved January 23, 2011. ^ "Charles Woodson College Stats". College Football at Sports-Reference.com. Retrieved February 24, 2018. ^ a b c Charles Woodson from CNNSI, obtained January 1, 2006. ^ "1997 Heisman Trophy Voting". College Football at Sports-Reference.com. Retrieved February 24, 2018. ^ Phillips, Larry (November 24, 2002). "Key Buckeye-Wolverine games sprinkled through every decade". Gannett News Service. Archived from the original on August 31, 2003. ^ Woodson reminds us all how amazing he is Archived September 22, 2006, at the Wayback Machine by Alan Goldenbach of the Michigan Daily, posted October 27, 1997. ^ 'M' back in Rose Bowl after 5 years Archived September 22, 2006, at the Wayback Machine by Alan Goldenbach of the Michigan Daily, posted November 24, 1997. ^ "1997 Michigan Wolverines Schedule and Results". College Football at Sports-Reference.com. Retrieved February 24, 2018. ^ "1998 NFL Draft Listing". Pro-Football-Reference.com. Retrieved February 24, 2018. ^ "NFL Defensive Rookie Of The Year". WTOP. February 3, 2018. Retrieved February 24, 2018. ^ "1998 NFL Defense". Pro-Football-Reference.com. Retrieved February 24, 2018. ^ "Oakland Raiders at Arizona Cardinals - October 4th, 1998". Pro-Football-Reference.com. Retrieved February 24, 2018. ^ a b c Charles Woodson #24 from NFLPA.com, obtained January 4, 2007. ^ "San Diego Chargers at Oakland Raiders - November 14th, 1999". Pro-Football-Reference.com. Retrieved February 24, 2018. ^ "Kansas City Chiefs at Oakland Raiders - November 28th, 1999". Pro-Football-Reference.com. Retrieved February 24, 2018. ^ "1999 NFL Defense". Pro-Football-Reference.com. Retrieved February 24, 2018. ^ a b Shoulder sidelines Charles Woodson by Nancy Gay of the San Francisco Chronicle, posted September 19, 2002. ^ "2000 NFL Defense". Pro-Football-Reference.com. Retrieved February 24, 2018. ^ "2001 NFL Defense". Pro-Football-Reference.com. Retrieved February 24, 2018. ^ "Charles Woodson 2001 Game Log". Pro-Football-Reference.com. Retrieved February 24, 2018. ^ Raiders CB Woodson says he'll be ready Archived November 14, 2005, at the Wayback Machine from Associated Press, posted December 30, 2002. ^ Raiders' key is Charles Woodson by Gwen Knapp of the San Francisco Chronicle, posted July 27, 2003. ^ "Super Bowl XXXVII - Tampa Bay Buccaneers vs. Oakland Raiders - January 26th, 2003". Pro-Football-Reference.com. Retrieved February 24, 2018. ^ "Charles Woodson 2002 Game Log". Pro-Football-Reference.com. Retrieved February 24, 2018. ^ "2003 Oakland Raiders Statistics & Players". Pro-Football-Reference.com. Retrieved February 24, 2018. ^ Charles Woodson rips Callahan after loss by Nancy Gay of the San Francisco Chronicle, posted November 3, 2003. ^ Raiders make Woodson franchise player from the Associated Press, posted February 22, 2004. ^ "Charles Woodson 2004 Game Log". Pro-Football-Reference.com. Retrieved February 24, 2018. ^ "2004 NFL Defense". Pro-Football-Reference.com. Retrieved February 24, 2018. ^ "Charles Woodson 2005 Game Log". Pro-Football-Reference.com. Retrieved February 24, 2018. ^ Raiders' Woodson, Gibson likely out up to two months from the Associated Press, posted October 24, 2005. ^ "2005 NFL Defense". Pro-Football-Reference.com. Retrieved February 24, 2018. ^ "2006 NFL Defense". Pro-Football-Reference.com. Retrieved February 24, 2018. ^ "Green Bay Packers at Miami Dolphins - October 22nd, 2006". Pro-Football-Reference.com. Retrieved February 24, 2018. ^ "Charles Woodson 2006 Game Log". Pro-Football-Reference.com. Retrieved February 24, 2018. ^ "NFL Game Center: Green Bay Packers at Kansas City Chiefs - 2007 Week 9". NFL.com. Retrieved December 20, 2010. ^ "Charles Woodson 2007 Game Log". Pro-Football-Reference.com. Retrieved February 24, 2018. ^ "2007 NFL Defense". Pro-Football-Reference.com. Retrieved February 24, 2018. ^ "Green Bay Packers at Detroit Lions - September 14th, 2008". Pro-Football-Reference.com. Retrieved February 24, 2018. ^ "Ex-Wolverine Charles Woodson's return to Michigan one to remember". ^ "Charles Woodson 2008 Game Log". Pro-Football-Reference.com. Retrieved February 24, 2018. ^ "2008 NFL Defense". Pro-Football-Reference.com. Retrieved February 24, 2018. ^ "Dallas Cowboys at Green Bay Packers - November 15th, 2009". Pro-Football-Reference.com. Retrieved February 24, 2018. ^ "Green Bay Packers at Detroit Lions - November 26th, 2009". Pro-Football-Reference.com. Retrieved February 24, 2018. ^ "Charles Woodson 2009 Game Log". Pro-Football-Reference.com. Retrieved February 24, 2018. ^ "2009 NFL Defense". Pro-Football-Reference.com. Retrieved February 24, 2018. ^ "Charles Woodson 2010 Game Log". Pro-Football-Reference.com. Retrieved February 24, 2018. ^ "2010 NFL Defense". Pro-Football-Reference.com. Retrieved February 24, 2018. ^ "Wild Card - Green Bay Packers at Philadelphia Eagles - January 9th, 2011". Pro-Football-Reference.com. Retrieved February 24, 2018. ^ "Divisional Round - Green Bay Packers at Atlanta Falcons - January 15th, 2011". Pro-Football-Reference.com. Retrieved February 24, 2018. ^ "NFC Championship - Green Bay Packers at Chicago Bears - January 23rd, 2011". Pro-Football-Reference.com. Retrieved February 24, 2018. ^ "Ring tells story of '10 and time". ^ "Charles Woodson". Rotoworld.com. September 9, 2010. Archived from the original on December 30, 2010. Retrieved December 20, 2010. ^ "Green Bay Packers at Carolina Panthers - September 18th, 2011". Pro-Football-Reference.com. Retrieved February 24, 2018. ^ "Newton more impressive in first two games than any rookie QB". ^ "Denver Broncos at Green Bay Packers - October 2nd, 2011". Pro-Football-Reference.com. Retrieved February 24, 2018. ^ "2011 NFL Defense". Pro-Football-Reference.com. Retrieved February 24, 2018. ^ "Charles Woodson 2011 Game Log". Pro-Football-Reference.com. Retrieved February 24, 2018. ^ "San Francisco 49ers at Green Bay Packers - September 9th, 2012". Pro-Football-Reference.com. Retrieved February 24, 2018. ^ "Chicago Bears at Green Bay Packers - September 13th, 2012". Pro-Football-Reference.com. Retrieved February 24, 2018. ^ "Packers S Woodson out 6 weeks, broken collarbone". Yahoo! Sports. October 22, 2012. Archived from the original on October 25, 2012. Retrieved October 22, 2012. ^ "Charles Woodson 2012 Game Log". Pro-Football-Reference.com. Retrieved February 24, 2018. ^ "2012 NFL Defense". Pro-Football-Reference.com. Retrieved February 24, 2018. ^ "Wild Card - Minnesota Vikings at Green Bay Packers - January 5th, 2013". Pro-Football-Reference.com. Retrieved February 24, 2018. ^ "Divisional Round - Green Bay Packers at San Francisco 49ers - January 12th, 2013". Pro-Football-Reference.com. Retrieved February 24, 2018. ^ Copeland, Kareem (February 15, 2013). "Charles Woodson released by Green Bay Packers". NFL.com. Retrieved February 17, 2013. ^ "Charles Woodson Rejoins Raiders". Archived from the original on June 7, 2013. Retrieved May 22, 2013. ^ Breech, John (October 7, 2013). "Raiders DB Charles Woodson ties NFL record for most defensive TDs". CBS Sports. Retrieved October 7, 2013. ^ Bair, Scott (January 31, 2014). "Playing Time: High Snap Count Hurts Thin Raiders Defense". CSNBayArea.com. Archived from the original on February 2, 2014. Retrieved January 31, 2014. ^ "Charles Woodson 2013 Game Log". Pro-Football-Reference.com. Retrieved February 24, 2018. ^ "2013 NFL Defense". Pro-Football-Reference.com. Retrieved February 24, 2018. ^ "Oakland Raiders at New York Jets - September 7th, 2014". Pro-Football-Reference.com. Retrieved February 24, 2018. ^ "Charles Woodson Career Stats". NFL.com. January 13, 2014. Retrieved January 31, 2014. ^ "San Francisco 49ers at Oakland Raiders - December 7th, 2014". Pro-Football-Reference.com. Retrieved February 24, 2018. ^ "Charles Woodson 2014 Game Log". Pro-Football-Reference.com. Retrieved February 24, 2018. ^ "2014 NFL Defense". Pro-Football-Reference.com. Retrieved February 24, 2018. ^ "Charles Woodson, Raiders reach deal". ESPN. Retrieved January 26, 2015. ^ "Denver Broncos at Oakland Raiders - October 11th, 2015". Pro-Football-Reference.com. Retrieved February 24, 2018. ^ Smith, Michael David (December 21, 2015). "Charles Woodson announces his retirement at end of season". profootballtalk.nbcsports.com. Retrieved December 21, 2015. ^ "Oakland Raiders at Kansas City Chiefs - January 3rd, 2016". Pro-Football-Reference.com. Retrieved February 24, 2018. ^ "Charles Woodson 2015 Game Log". Pro-Football-Reference.com. Retrieved February 24, 2018. ^ "2015 NFL Defense". Pro-Football-Reference.com. Retrieved February 24, 2018. ^ Snyder, Mark (July 19, 2007). "Ex-Wolverine Woodson creates wine, but NFL prevents his touting it". Detroit Free Press. Archived from the original on August 1, 2008. Retrieved July 20, 2008. ^ "Charles Woodson Foundation". Charles Woodson Foundation. Retrieved December 20, 2010. ^ "Packers' Charles Woodson donates $100K to storm relief". Associated Press. November 1, 2012. ^ "Green Bay Packers star Charles Woodson explains President Obama jab". Politico. April 27, 2012. Retrieved May 31, 2013. ^ "Woodson on Obama: 'I believe in what he's trying to do'". ESPN. November 1, 2012. Archived from the original on November 12, 2012. Retrieved May 31, 2013. Wikimedia Commons has media related to Charles Woodson.